Orbs.it has won the “Best Technical Achievement” award for in the Imirt Awards for 2017! 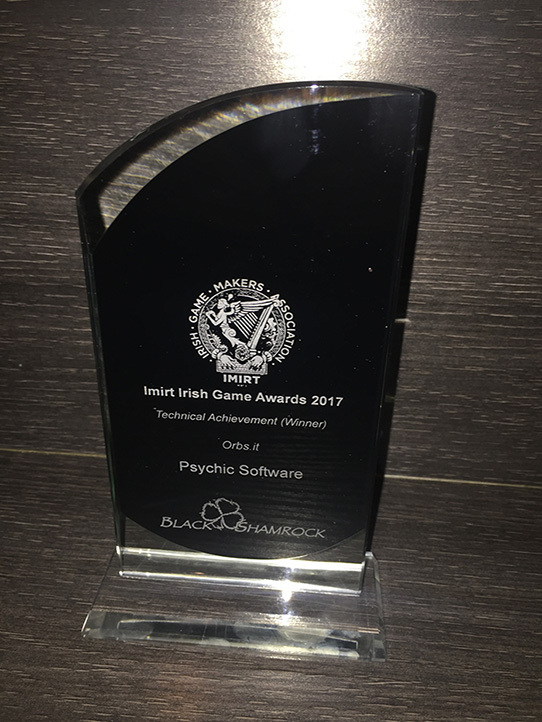 Imirt is the Irish Gamemaker’s Association. Newby Chinese is a gamified system for learning Mandarin Chinese in a fun way, initially in a supervised classroom environment. I have been working on this with my friend and project collaborator Richard McCurry since 2016, and Richard’s core concept (which was always very engaging) has, in the last 9 months or so, really fleshed out and taken shape as a set of minigames and challenges tied together into competitive multiplayer races. 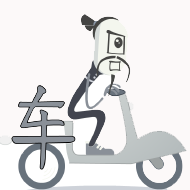 Our first customer (a secondary school) starts using Newby Chinese in a couple of weeks time. Last week we presented a paper at an academic conference – IEEE Games, Entertainment & Media. This included a demo of some of the interactive multiplayer minigames which make up our learning system. It went really well, and the 20 or so participants found it very engaging. My heavily-cached Ajax-and-Websockets NodeJs server performed exactly as I had hoped. For more details and discussion you can download our full IEEE GEM conference paper here. You can try a demo of Newby Chinese here. The main Newby Chinese website is here. Last week I co-presented a paper in which we discussed two related research projects: Lie2Me and Fool Me Once. In these, I’ve been working with Denis O’Hora, a colleague in NUIG who works in the Psychology Dept. We’re investigating the dynamic body-language features which are apparent when users are lying, and as part of this we had an installation for 3 months in the Science Gallery in Trinity College Dublin. 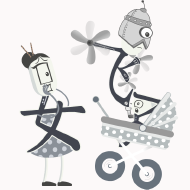 Our continuing work will, among other things, perhaps lead to useful applications in games artificial intelligence (AI), whereby AI agents can act more human-like, perhaps through mimicry or perhaps through deeper analytical “understanding” of human actions. My related work from 2011 was in the field of pathfinding in my car combat MMO “Darkwind“. You can download our research paper here. You can participate in the Lie2Me experiment here. I took part in a game jam on Saturday, and we won! My main collaborator was artist Niall O’Reilly from local game art company DoomCube. 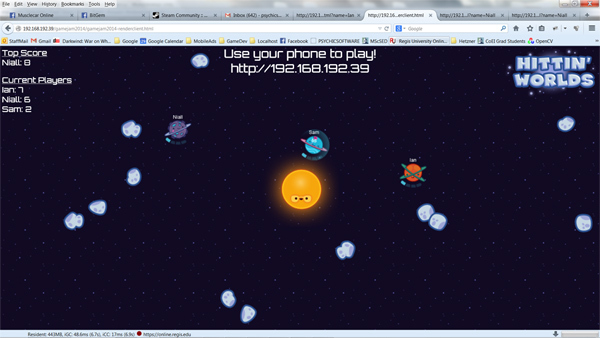 The game runs using HTML5/Canvas, with a node.js websockets server. The ‘render client’ ran on my laptop and players ran the ‘controller client’ on their phones.. this seems like a really nice way to do casual LAN-style multiplayer games, and it’s a configuration I have been thinking about for a few weeks. I just need to figure out a killer party game idea to use it with! 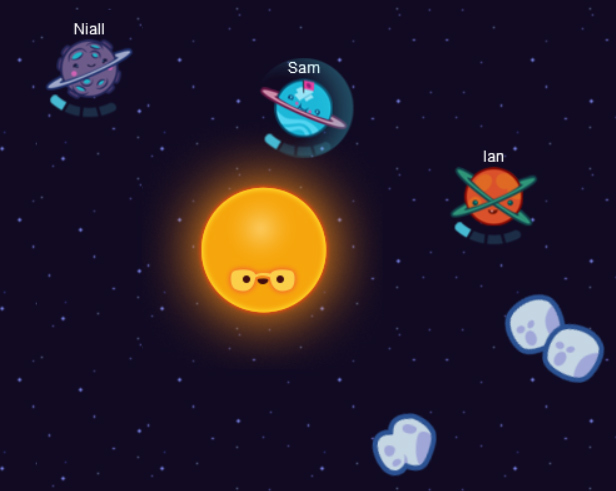 In “Hittin’ Worlds” Each player plays as a planet, in orbit around a sun. Asteroids are flying about, and players have to use their forcefield to deflect them. By using a virtual joystick-style controller on their phone, they orient the forcefield in specific directions.. incoming asteroids get deflected in that direction. The idea is that players fling the rocks at each other while defending themselves. We also had a really nice piece of custom music written by a guy called Ian, from Athlone/Reading.